I'm sure you've seen the cool potato sack-esque storage bags circulating around the web. They're a practical storage solution for kids rooms and other spots around the house. This simple update looks fantastic and has me ready to grab the ol' paintbrush! If there's one thing that's better than scoring extra storage, it's creating said storage out of unused items you have lying about the house! And lucky for us, there are plenty of great tutorials online for repurposing old items and turning them into something that's not only functional, but also looks a million dollars. Click through for my favourites! Maybe it's just me, but I am always in need of a few extra spots to store props & knick-knacks. These beautiful leather baskets are just the ticket! And the tutorial looks simple enough to make several in an afternoon! I am all for adding fun art pieces to the walls in my home, especially when they serve a functional role as well! These fun geometric wood and color coat hooks are an easy solution when your room is lacking a little character and color...and storage. Let's make some! Need more closet space in your life but don't actually, you know, have extra closets? Well, you've come to the right place! This rolling garment rack is a great alternative and functions wonderfully as impromptu entryway or mudroom storage! While my jewelry collection isn't particularly large (at least compared to some! ), it seems like I can never keep it properly organized. If you're in the same boat, check out this super awesome, super modern, and ridiculously easy DIY organizer! Can we take a moment and all agree that these jewelry holders are ridiculously cute? Yes? Okay, great. Now, let's find out how to make 'em! I'd be lying if I said I wasn't completely obsessed with planters right now. My plant collection is slowly growing and, obviously, each one needs its own container! I have a few awaiting homes and I think these DIY wooden geometric planters may be the perfect solution. Store-bought boxes and bins can be prohibitively expensive if you're trying to get organized on a budget, but that's no excuse - there are plenty of DIY storage container projects that won't break the bank (and they're pretty, too!). Here are ten of my favorites. Take a long and hard look at the food in your kitchen. It doesn't have to be hiding out in the cupboard! And it doesn't have to be unorganized! 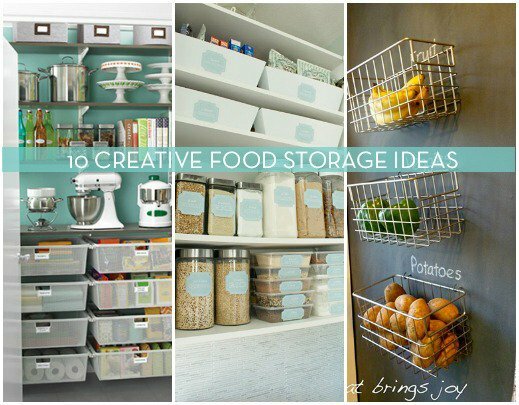 Here are 10 creative ways to store your food! When you've got a blank wall and regular floating shelves are just too boring, what do you do? Build this awesome triangle shelving system, that's what! I'm always looking for clever, inexpensive ways to add more storage and organization to my space. When I spotted this simple, modern desk organizer, I knew I needed to add it to my project list, STAT! Basket weaving is one of the oldest and most common crafts throughout history (fun fact: the oldest baskets ever found are between 10,000 and 12,000 years old -- crazy, right?). Now, in Internet Bloggy Land, they're used more for decor than hauling life-sustaining items, but that doesn't mean the art of basket weaving should be left by the wayside! I have a confession: I think I might be becoming one of those "basket" people. As a kid, I always wondered why people had so many dang baskets in their houses, but it turns out they're really, really handy. Who knew? The last three months of the year end faster than they come, and before you know it, there's a week left until Christmas and then it's time to clean up the decor. It can be tricky keeping everything organized during the chaos that comes with the holidays. Here are a few ways to help you stay on top of everything so that the clean up is (somewhat!) minimal. Sometimes the simplest ideas are the best, like in the case of this too-clever-for-words storage project from French decor blog Heju! It seems like laundry hampers fall into two categories: stylish but ridiculously overpriced OR something that looks like it belongs in a dorm room surrounded by week-old pizza. So where do you find a good looking hamper on a student-sized budget? Right here, my friends. Whether you're looking for some entryway storage or your bedroom is short on closet space, this clever DIY wardrobe is the perfect solution!